No fewer than four wildfires are blazing in California as we approach mid-November, past the end of the typical fire season. We’re committed to fighting the climate change that enables these fires. 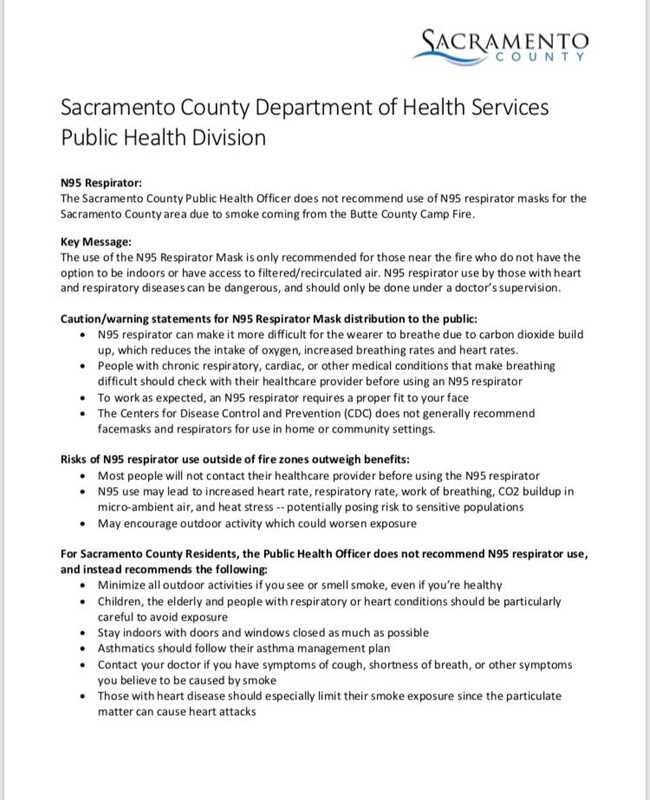 But in the meantime, it’s important to examine the health impact from wildfires and how to keep yourself protected from smoke-filled air. In the last decade, California wildfires have become more common and more deadly. And studies suggest that climate change will only make fire season worse. As wind carries smoke to areas hundreds of miles away, wildfires pose danger for Californians who live far beyond the fire’s boundaries. 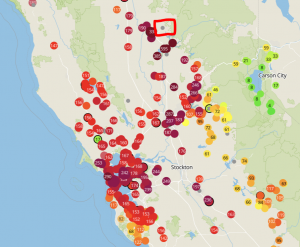 Since the Camp Fire began, for example, the San Francisco Bay area has had unhealthy air every single day, despite being over 150 miles from the fire itself. A snapshot of air quality in the bay area 6 days after the Camp Fire began. Paradise, where the fire broke out, is circled in red. What exactly makes up all that unhealthy air? Much of the smoke from wildfires comes from burning wood, similar to smoke you might find at a bonfire. And just like bonfires, whose particulate emissions per minute equate to about three average diesel big-rigs or the secondhand smoke from 800 cigarettes, this smoke is full of harmful emissions. Wood smoke produces a variety of unhealthy pollutants, including PM2.5. These tiny particles lodge deep in your lungs and can cause heart problems, decrease lung function and aggravate asthma. You can track PM2.5 through CCA’s robust CLEAR air quality network to monitor the severity of the bad air you may be exposed to. Wildfire smoke also carries toxic carcinogens like polycyclic aromatic hydrocarbons (PAH). Exposure to PAHs has been consistently linked to higher incidence of lung cancer and cardiovascular disease. Of course California wildfires don’t just burn wood, and the pollutants in wildfire smoke are as diverse as the material burned. As fires engulf buildings, they burn plastics, mercury-containing fluorescent lights, and other substances which release toxic byproducts into the air. Mercury in particular poses a potential danger in wildfire smoke. 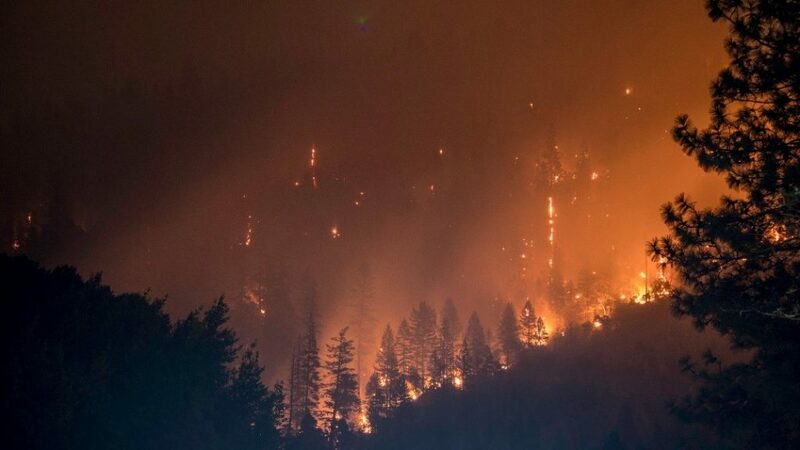 Wildfires release as much as 30% as much mercury into the air as industrial sources do nationwide. A neurotoxin, mercury poisoning can lead to impairment of speech, hearing and walking, muscle weakness and vision problems for people of all ages. But its effects are particularly dangerous for infants and children. Infants in the womb whose mothers are exposed to mercury are more likely to experience a host of developmental problems, including impacted cognitive thinking, language learning, and fine motor skills. If you can smell smoke, you’re breathing smoke. Minimize your time outdoors and consider wearing an N95 or P100 respirator when you need to go outside for extended periods of time (standard dust masks can’t protect you from particulate matter and toxic pollutants)1)Coalition for Clean Air does not offer medical advice. We recommend that anyone concerned about reducing their exposure to air pollution contact their physician..
Monitor air quality near you. Make sure your home air filter is clean and functioning properly. Inspect your car’s cabin air filter and swap it out if necessary. 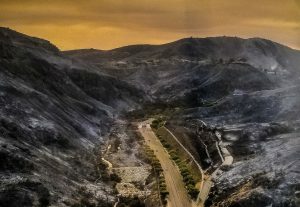 Bell Canyon after the Woolsey Fire. Photo courtesy of Los Angeles Mayor Eric Garcetti. Even after the fire is gone and the smoke clears, health risks posed by them can live on through re-entrainment of toxic materials carried in ash. When cars start whizzing down the road and bulldozers clearing burned down structures, ash can be swept back up into the air and into your lungs. When possible, avoid areas recently affected by fires, including altering the route you take to your destination. If you need to spend an extended amount of time in these areas, consider wearing a respirator. Refrain from using leaf-blowers, which blow ash back into the air. If you need to clean up ash from your belongings, use damp cloths to wipe it off. 1. ↑ Coalition for Clean Air does not offer medical advice. We recommend that anyone concerned about reducing their exposure to air pollution contact their physician. This entry was posted in California Wild Fires, Clean Air. Bookmark the permalink.